ST. AUGUSTINE, Fla. - It was tough going against either Jack Nicklaus or Arnold Palmer in their prime playing days, and it's even tougher going against them as golf course architects. The Slammer and Squire was designed by Bobby Weed with input from Sam Snead and Gene Sarazen. Still, the powers at the World Golf Village got some pretty big names to lay out the village's second course. The Slammer and Squire at World Golf Village was designed by architect Bobby Weed, who lives in nearby Ponte Vedra, with "player consultants" Sammy Snead, aka the "Slammer," and Gene Sarazen, aka the "Squire." No player consultants for Arnie and Jack, the King and the Bear, respectively. The King and the Bear course was obviously meant to be the star attraction at the village, and it is longer and more challenging than the Slammer and Squire. It certainly wouldn't do to have a course outshine those two names. But the Slammer and Squire certainly has its charms. 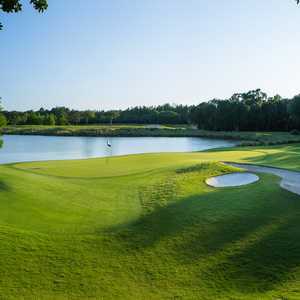 It plays through the same classic, north Florida terrain many of the area's more famous courses do, through pine forests, hardwood stands and wetlands. It is meant to be played by the many tourists who come to the village to see all the golf-related stuff, like the Hall of Fame, of which all four of these men belong to. "We built a golf course that people will enjoy playing and included the need for some good shot making," Snead said in a promotion for the course before he died. In other words, they didn't want to beat up the tourists after they had been to the Hall of Fame and seen all those great shots. In that respect, they succeeded. "It's sort of wide open, which is good for a guy like me," said Michael Kaplan of Fort Lauderdale. "There's no crazy trouble." The Slammer and Squire can stretch out to 6,939 yards - the King and the Bear checks in at 7,279 yards - and has two very different nines: The front nine is tree-lined, while most of the back nine fairways are bordered and defined by water. And, like Snead said, you still have to hit some shots, for crying out loud. The par-5 fourth hole can be a (excuse me) bear. It's a classic risk/reward hole, with a grass-lined creek meandering up the fairway at about a 45 degree angle to the tee box. It's a prodigious carry from the back tees, which you must do if you want to show off your man chromosomes and reach in two. In fact, Nos. 4, 5 and 6 are all challenging holes, the last two being long par 4s with various obstacles along the way like water, woods, bunkers and fairways that drop off both sides in the case of No. 6. The short, drivable par-4 14th is a blast, and the three closing holes are all interesting, especially No. 16 with its slightly elevated fairway. The World Golf Village wanted to preserve the natural beauty of this area, and it did a good job of that. There are no homes along the course, and the views are only marred, if I may say so, by the views of the village buildings themselves. "What's so nice about this course is there's nothing else around," Kaplan said. "It's beautiful." As you would expect, the service is excellent as is the conditioning, although on the day I played in August, the greens could only be described as being in decent shape, a mild disappointment for a facility backed by such luminous names. Nor could you call it a walker's course, with several long drives between holes. It is, however, a good course for the ladies, with its lack of substantial, forced carries. The course has the PGA Tour Golf Academy on grounds, and the clubhouses have excellent restaurants, though you'll probably go to the Caddy Shack restaurant hoping to see Bill Murray. Green fees range from $99 to $159 in peak season. 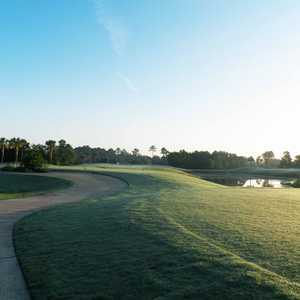 St. Augustine is a great place to play both the Ponte Vedra golf courses - just a short drive away down scenic A1A - as well as the St. Johns County courses at the World Golf Village. And if you're going to stay in America's oldest city, why not stay in a bed and breakfast in one of the city's old houses? The Inn at Charlotte is a plush home that has been restored, and each of the eight rooms is carefully decorated with antique furnishings and accessories. The inn has a gourmet breakfast and is right across the street from one of my favorite St. Augustine bars, the Teeny Martini. Casa de Solana, dating back to circa, has an air of Spanish and English mystery and charm, from the Minorcan Suite with fireplace to the Segui Room. The inn has a landscaped, walled courtyard on brick-paved Aviles Street. Each of the 10 rooms and suites are big and authentically part of St. Augustine's Minorcan history. The St. Francis Inn dates back to the 1700s, an attractive pairing of old world charm and modern. Built by Senor Gaspar Garcia, the house is made of native coquina shells with a private courtyard and pool. It's located in the shady historic district and still within easy walking distance of shopping, dining and the pleasures of St. Augustine. Each of the 17 rooms is unique: a combination of suites, a private cottage, the 1880 "Wilson House" and a beach house on Anastasia Island. The Southern breakfast buffet is excellent, they have bicycles for cruising around downtown and - drum roll, please - they have free sherry.